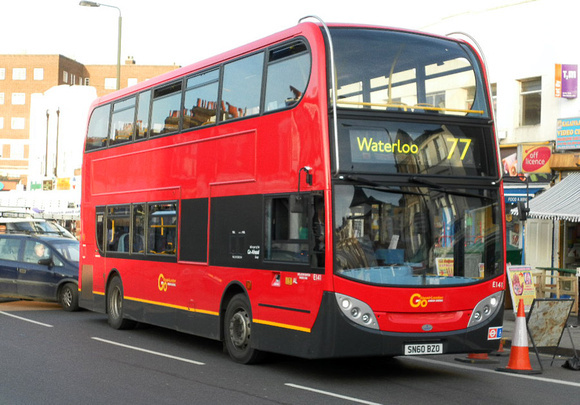 Sunday GM allocation transferred to Q.
Sunday rerouted via Vauxhall Bridge and renumbered 77B. Merton (AL) allocation converted from D to RT. Stockwell (SW) allocation converted from STD to RTL. Saturday only SW allocation withdrawn. Saturday diverted via Vauxhall Bridge and renumbered 77B. 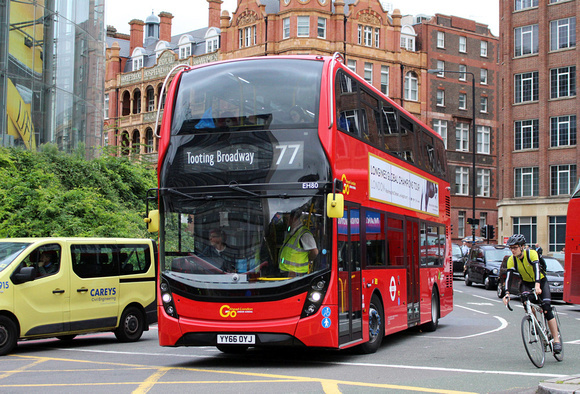 Sunday introduced Kings Cross to Tooting to replace withdrawn 77B. RM vehicles introduced on a daily basis. Mon-Fri withdrawn between Aldwych and Euston but extended from Aldwych to Farringdon Street via withdrawn Route 168 Mon-Fri peaks. Additionally extended from Tooting to Streatham Garage. Sunday withdrawn between Charing Cross and Kings Cross. Withdrawn between St Leonards Church and Garage in Streatham. Saturday & Sunday Stockwell (SW) allocation reintroduced. D type (crew) introduced at Stockwell. Mon-Fri peaks diverted at Aldwych to Kings Cross instead of Farringdon Street. Mon-Fri Stockwell (SW) allocation introduced. Converted to One Person Operation. Sunday Stockwell (SW) withdrawn in favour of new AL allocation. Mon-Fri mid-day extended from Aldwych to Euston. Sunday extended from Charing Cross to Russell Square. Mon-Fri Stockwell (SW) allocation withdrawn. Mon-Fri diverted at Amen Corner to Tooting Station instead of Streatham. Mon-Sat garage journeys introduced to Merton via Mitcham. 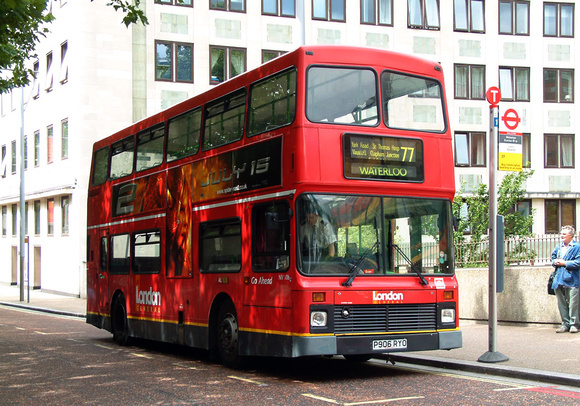 Mon-Fri evenings extended from Aldwych to Russell Square. Convert to low floor operation. Changeover point TOOTING BROADWAY Longmead Road - TOOTING Mitre stand - or TOOTING BROADWAY Mitcham Road. Garage journeys leave line of route at Tooting Broadway and observe Route 155 stops to garage or leave line of route at Mitcham and observe Route 152 stops to garage. Garage journeys leave line of route at WANDSWORTH ROAD Lansdowne Way and run light to garage.